Vacuum diffusion pumps require an effective heating system to drive the pump. Conventional designs often employ a complicated series of components that must be carefully matched up, adding unnecessary time, labor, and cost to the replacement process. Many vacuum diffusion pumps use a tubular heater, clamping plate, and crush the plate assembly for fluid heating. 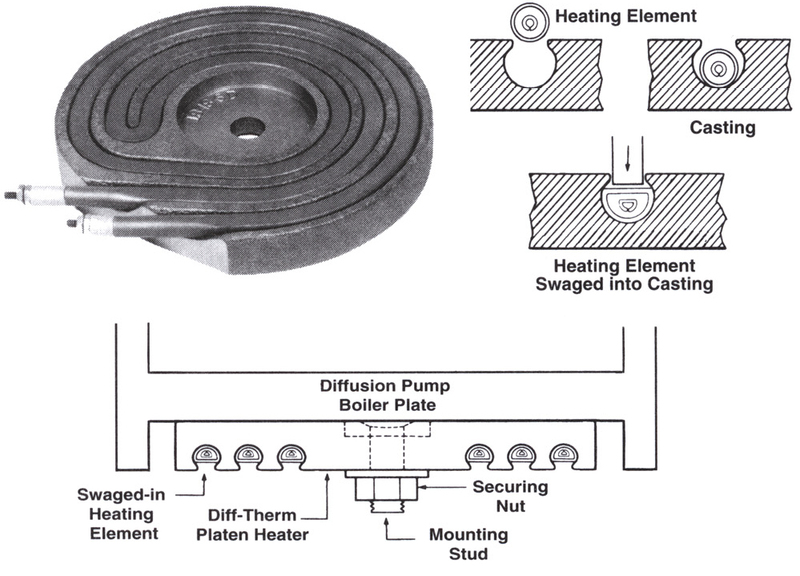 The tubular heater is pushed against the pump boiler plate by a dimpled crush plate. Heat transfer is limited to those points at which the heater makes contact with the flat boiler plate. 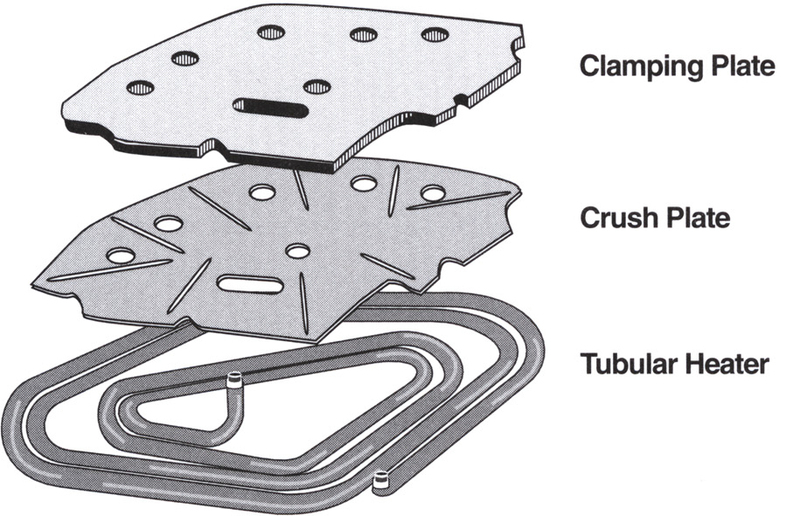 The crush plate is held in place by a clamping plate which is attached to the base of the pump by one or more studs. Proper alignment of the assembly is critical and can be difficult if space is limited. Diff-Therm vacuum diffusion pump heaters solve this problem of conventional heater design. the tubular element is swaged directly into a cast iron platen, increasing the density and uniformity of the insulation for better heat transfer. Better heat transfer means longer heater life. The one-piece Diff-Therm assembly simply bolts to the bottom of the boiler plate, replacing the tubular heater, crush plate, and clamping plate thus eliminating the complicated alignment process. Compared with the limited contact area (one side of the tubular element) of conventional designs, the flat surface of the Diff-Therm platen provides greater contact area for more effective heat transfer to the boiler plate. Dalton Electric Heating Company manufactures and stocks Diff-Therm heaters for almost every pump model. Diff-Therm heaters are available for 2" to 48" Diffusion Pumps in over 100 combinations of electrical and casting sizes.